We woke up beside Khyar-Gas Nuur (“Nuur “means lake in Mongolia) after a very peaceful night’s sleep. Dead quiet, balmy night, cool but not cold in the morning. Our solitary tire tracks show how remote this shore of the lake was. We continued for another 60kms or so along a wonderful Chinese sponsored paved road before it suddenly ran out and roadworks continued for the next few hundred kilometres. We drove alongside the road works on sandy desert roads that were the typical Mongolian Multi-lane roads. i.e. : pick a track, any track and hope it is OK.
After several hours of relatively high speed driving on soft sand tracks trying hard to miss the washaways and potholes, we stopped for lunch beside a curious roadside shrine. Finally the surroundings “greened-up” and more animals and gers were seen. Curious how horses all congregate in a group standing in a pool of water. Heads inwards, backsides outwards! More small colourful villages were passed through and more dust and open plains beckoned. Sheep and goat roadblocks were commonplace. Camels appeared again, roaming free. We finally arrived in the town of Tosonchengal, and old forestry town in Western Mongolia. It was late at night and rainclouds were around. It was not a night for camping, so we sought a hotel. The Lonely Planet guide recommended hotel had closed, and we had only seen one other hotel in town. We drove up and checked it out. No english, a restaurant that you wouldn’t dare eat in, but it had 4 very basic rooms. No running water, drop and squat loos, but it was all there was and they let us park our cars securely around the back near the drop loos! The smell would keep the thieves at bay. We cooked up dinner ourselves in the washroom next to our rooms. i.e. : A sink with a bucket of water above it. Bed was rock hard but it was clean enough and the rain poured overnight so we were grateful. Nothing worse that a sodden campsite in the morning! As no breakfast was on offer in this hotel (thank goodness), we set off after dawn and crossed the town weir and headed south-east towards the town of Tsetserleg, a route recommended ny the NZ guide, Greg! We entered dense green forest, a wonderful surprise, and stopped by the side of the road for breakfast. 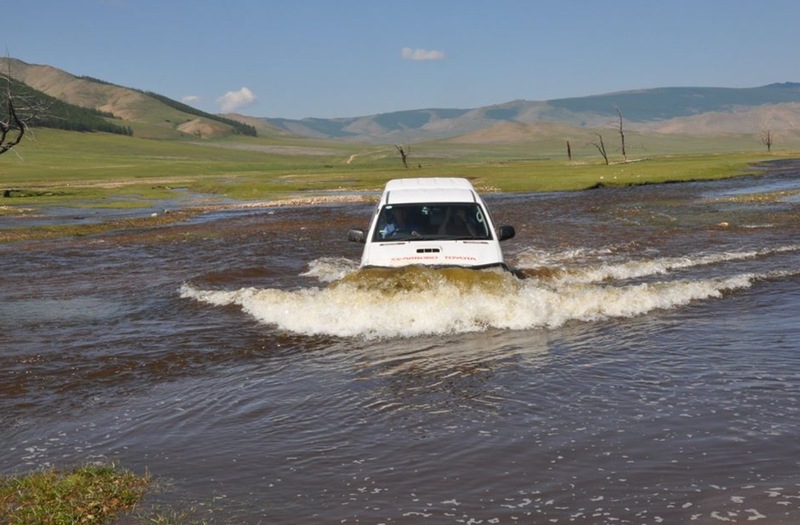 For the nest hour or so we weaved along tracks through the mountain forests and green rolling plains, until we came onto a flat plain and our first serious water crossings. The rain overnight had raised the levels and the streams were higher and flowing fast. A couple on a motorcycle had been waiting by the side of the river and indicated the water was well above the level of the fuel tank of their motorbike. They turned back. On the other side of the river we saw a couple of guys in a truck wading and checking the river. Finally they decided to give it a go. What made this crossing complicated was that the river had broken into 4 fast flowing streams, each different and some shallower, others deeper. We watched the truck come through. They then stopped on our side and by gestures we asked them how deep the water was, and whether we could get through. They walked around and studied our cars, indicating the water levels on our mudguards. They then gave us the thumbs-up. Go for it. Pete again waded in and checked the depths and searched for obstacles. The Quokkavan went first as it has much more clearance than C-YA the Hilux. We thought that if C-YA got stuck, they could pull us out. As a precaution to flooding the engine bay, Andrew lashed a tarp across the front of C-YA to stop the water rushing in and hoping the bow wave would be deflected away from the engine and air-intake. Happliy, all worked well, without drama, although C-YA took a minute or two to drain all the water out from under the body! To add to the wonders of the day, the next stage involved crossing a high mountain pass, the Solongetyn Davaa. 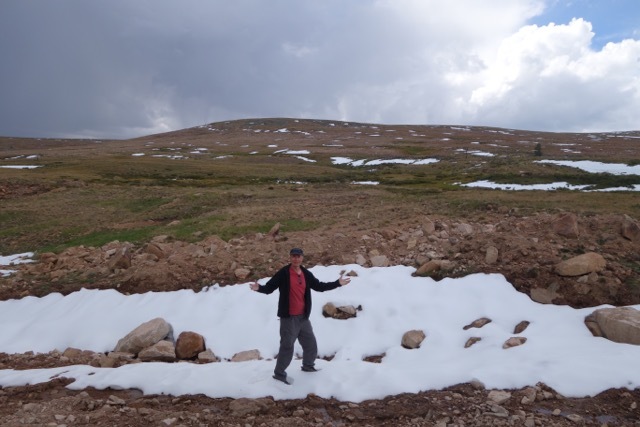 At 2500 metres what did we find? Snow! 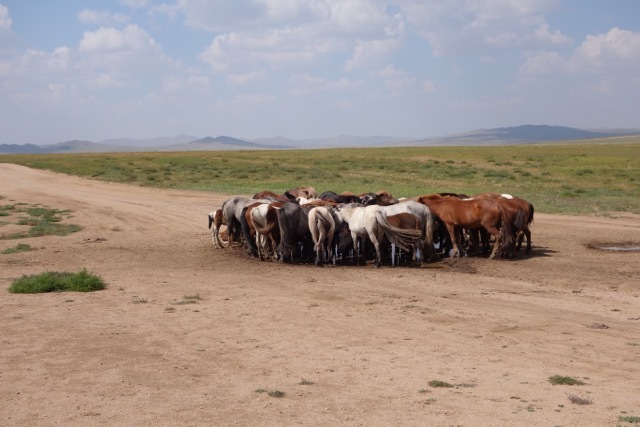 Mongolia is truly a country of wonders! Again the rolling green plains beckoned and we finally arrived at the town of Tsetserleg, our destination for the night. We wanted a shower and comforts after the no-star hovel the night before. We found a great little hotel and also a cafe-bakery run by an Australian married to a Mongolian lady. We had Aussie burgers and chips and coleslaw followed by tea and carrot cake. Bliss! We returned in the morning to this same cafe for a full English breakfast. Pure heaven! 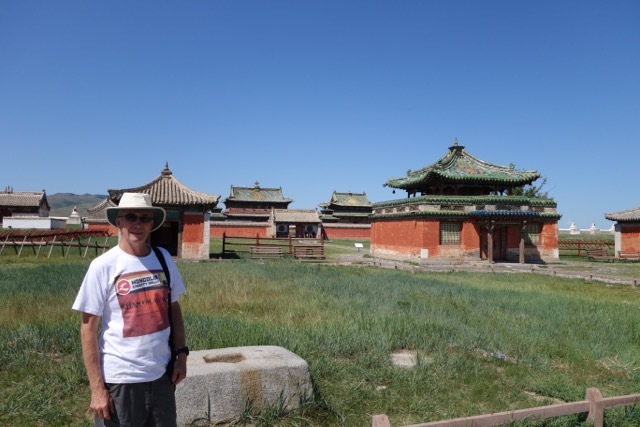 Our goal for the day was to head firstly SE to Kharakhorin, once the ancient capitol of the Mongol empire and then cut south to the edge of the Gobi desert. Kharakhorin was established in the 13th century by Chinggis Khan as a supply base. Later his son Ogedei ordered the construction of a proper capital, a decree that attracted traders, dignitaries and skilled workers from both the East and the West. Unfortunately, the good times lasted only about 40 years until Kublai Khan decided to move the capital to Khanbalik ( now called Beijing). Following the collapse of the Mongol empire, Kharakhorin was abandoned and later destroyed by vengeful manchurian soldiers in 1388. In it’s heyday it had between 80 to 100 temples, about 300 gers and up to 1000 monks in residence. The Stalinist purges of 1937 put the monastery out of business and all but 3 of the temples were destroyed. An unknown number of monks were either killed or sent to Siberian gulags. 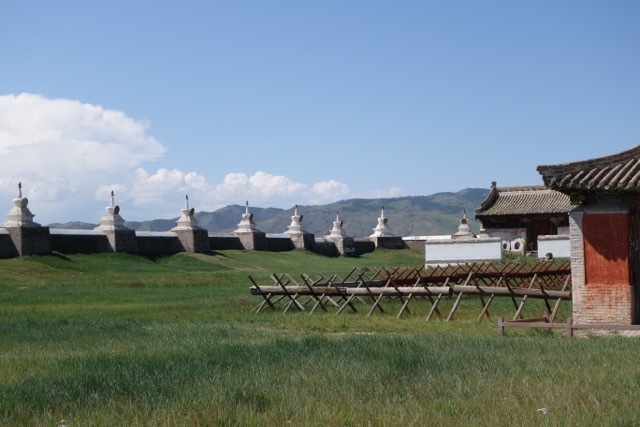 As we arrived at this now active monastery, considered by many to be the most important buddhist monastery in Mongolia, we were impressed by the beautiful encircling walls with their wonderful white domes around the walls. Inside we encountered monks praying and chanting and turning their prayer wheels. The 3 remaining temples are very decorated and dedicated to the 3 stages of Buddha’s life, childhood, adolescence and adulthood. We continuued southwards, at first on a paved road but this quickly reverted to the typical multi-lane tracks across the steppes! 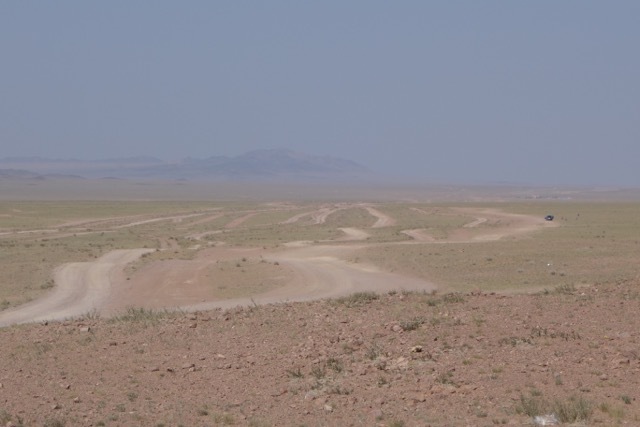 We arrived at Arvaikheer, on the edge of the Gobi. 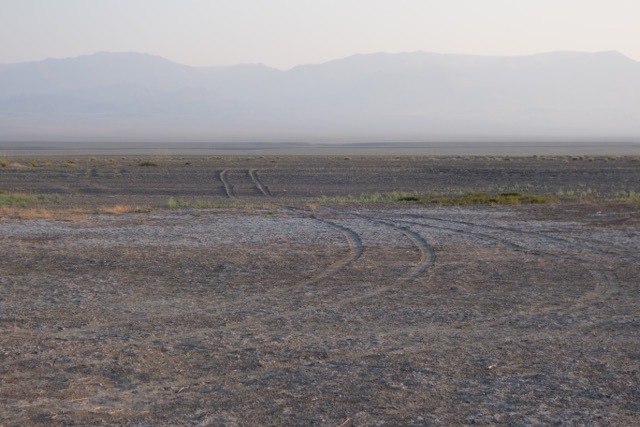 Tomorrow we enter and hope to camp in the Gobi overnight before travelling on to our final destination, Ulaanbataar!